Slacks vs Dress Pants: Which One is Best? In many cases, you might have assumed that the term “slacks” was simply an unconventional way to refer to dress pants, but did you know that they are actually two very different types of pants? When it comes to choosing between slacks and dress pants, it’s important to think of the occasion, how they are designed, and the type of look they offer. In most cases, slacks can be an ideal choice, but for occasions that are more formal, you’re going to want to opt for traditional dress pants. With the help of this guide, you’ll not only learn the differences between slacks and dress pants but also when it’s appropriate to wear either. There are several important things to think about when you look at slacks vs dress pants, including their style, the available fits, as well as any treatments that may be applied to the fabric. As one of the most important things to think about when it comes to choosing the right pair of pants, you’re going to need to consider their fit as this can influence the style you’re trying to achieve. This is also one of the largest differences between slacks and dress pants as one offers far greater fit than the other, and for good reason. As slacks are more of the business-casual type of pants, you’re going to notice there are a few more fits available than there would be with formal dress pants. This is because slacks can be paired with relatively any top, regardless of if you’re trying to dress them up or dress them down. Depending on your personal style, this can be quite beneficial, though it might take you a little bit longer to find the perfect look you’ve been searching for. Typically, slacks can come in straight, classic, slim, skinny, or boot cut. Choosing the right fit not only depends on your body type, but also the type of shoes you intend on wearing. For example, a classic fit works well with dress shoes, as does a straight and slim fit. However, a skinny or boot cut fit is better with sneakers, boots, or casual walking shoes. 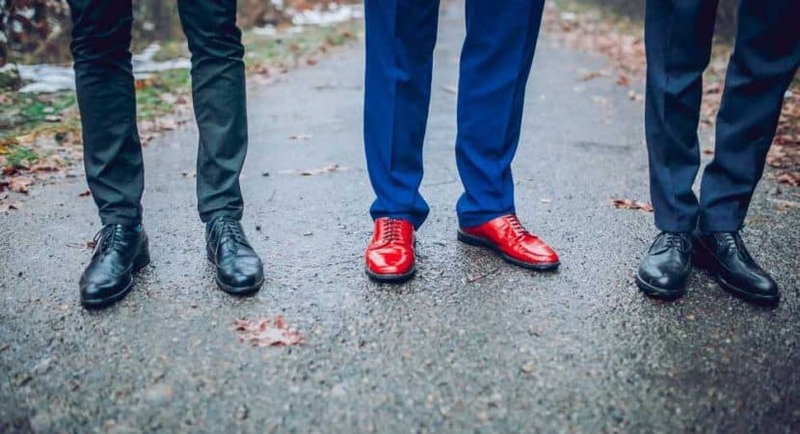 There are far fewer fit options when it comes to dress pants mostly because you typically don’t dress them down which means you’ll only be pairing them with some type of dress shoe. With that being said, it’s far simpler to find the right fit as there are only a few to choose from and they’re typically reserved for formal occasions or everyday business wear. Classic, straight, and slim are the three most popular dress pant fits and each accommodates different body types, for example, slim is recommended for leaner bodies however classic is perfect for a traditional appeal and a bulkier physique. In terms of variety, slacks are by far the better option when it comes to finding pants as their extensive list of fits give you the ability to choose the perfect pair for everyday wear. Fabric treatments are particularly important, as they not only influence the feeling of the pants you’re wearing, but also their longevity. The more treated a pair of pants are, the more likely they are to last a long time and withstand things such as color fading, and accumulation of lint, and even static. Slacks typically don’t offer any type of fabric treatments and if they do, it’s mostly something pertaining to colorfastness. As they are the more casual of the two, you’ll be more likely to wash them on a regular basis and as such, ensuring they do not fade is of the utmost importance. On the other hand, dress pants most often have a few fabric treatments that are designed to make maintaining and wearing the pants far simpler. For example, you can find pairs that have non-iron treatments that prevent you from having to get rid of unsightly wrinkles. You may also be able to take advantage of lint- and static-free materials, which help to make the pants ready to wear as soon as they come out of the dryer or dry cleaners. There’s nothing better than being able to take advantage of fabric treatments that are designed to preserve the integrity of your clothing. With dress pants, you’ll be able to reap the benefits of multiple treatments that are purely designed for comfort and versatility. As another giant different between slacks and dress pants, style is an important factor to consider. The term “slacks” envelopes a wide variety of different types of business casual and purely casual pants, whereas dress pants are exactly as their name suggests – a dressier alternative. Thinking about style will give you exactly what you need in order to dress appropriately for an upcoming occasion. As mentioned, there are many different styles covered by slacks including khakis, chinos, corduroy pants, and more. However, they are not as formal as dress pants which can work in your favor in most cases but also work against you. You may be able to dress up a pair of slacks with a formal shirt or blazer, but it surely won’t set as striking of an appeal as a traditional suit. Dress pants don’t cover as many styles as slacks as you can typically choose between pleated (a single crease in the front of the pants) and flat (no crease). But, they are the perfect option for more formal events where you’ll be required to dress up and make the best first impression possible. As dress pants are formal at their core, you won’t have to dress them up, but you can also dress them down by choosing a more casual top, which makes them fully adaptable. It’s hard to choose a clear winner between dress pants and slacks when it comes to style as it all depends on the type of event you’re getting ready for. At times, you may only be able to get away with formal attire (dress pants) and other times, you might be able to work with a more casual look (slacks). Choosing the final winner between slacks vs dress pants is all up to your personal style and what you feel comfortable wearing. If you have a career where business casual is the appropriate dress code, you can take advantage of customizing your wardrobe by choosing between a variety of different pant styles. However, this can be relatively time consuming and overwhelming for the everyday man who doesn’t particularly enjoy shopping. On the other end of the spectrum, dress pants give you the ability to have a perfect formal appeal, but they may not be appropriate for every occasion. Choosing dress pants can be significantly easier as there are only three common fits to choose from, but they can feel restricting and less comfortable against the skin. However, they are typically treated to last several years in comparison to slacks, which will deteriorate over time. Your best choice is to think about the occasion you’re getting ready for and determine which pair of pants would be the most appropriate as this will help you to look your best and feel comfortable at the same time.